(Toronto, Ont.) 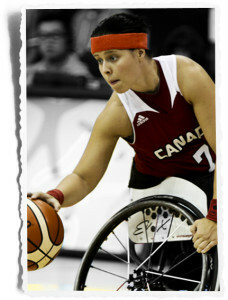 With their sights firmly set on representing the maple leaf at the Rio 2016 Paralympic Games, hopefuls for the Canadian Women’s Paralympic Wheelchair Basketball Team will welcome rivals from Great Britain, the Netherlands and the United States for a series of exhibition games at the Toronto Challenge from March 30 to April 3, 2016 at the Mattamy Athletic Centre. TV/Photo Op: Catch a glimpse of the speed, skill and athleticism of elite wheelchair basketball athletes set to star at the Rio 2016 Paralympic Games. Media are invited to attend an open practice on Thursday March 31, 2016 from 9-11 a.m. ET. Interviews with Team Canada athletes and coaches can be scheduled by contacting Courtney Pollock at 613-291-6721 or cpollock@wheelchairbasketball.ca.